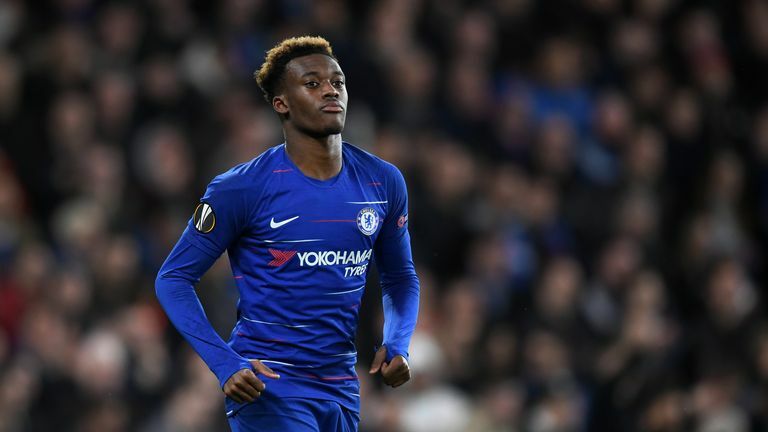 Bayern Munich have stepped up their interest in Chelsea's Callum Hudson-Odoi, and German football journalist Raphael Honigstein says the youngster has a 'cult following' in the Bundesliga. Sky Sports News understands Bayern have made the England U19 international their top target in what could become one of the biggest deals of the January transfer window. "It's not a sudden interest," said Honigstein. "He's had a cult following among Bundesliga supremos for quite a while. There's been a lot of clubs interested in him, and he's made so much progress. "It's the [Jadon] Sancho effect - everyone thinks they can get the next Sancho, and I also think from his point of view, he thinks he can be the next Sancho, doing what Sancho's done going to the Bundesliga. German football journalist Raphael Honigstein says the Hudson-Odoi has a 'cult following' in the Bundesliga. "What I think was only a theoretical possibility six months ago has become very realistic and very doable because both sides now see the benefit when it wasn't as clear before. "Bayern were interested in buying Sancho but he chose Dortmund, thinking it might be a better career move for him because he was guaranteed game time. At Bayern, he still had [Franck] Ribery and [Arjen] Robben in front of him. "Things have changed now and speaking to one or two scouts, many people think he's going to light up European football. "It reflects a little bit worryingly for [Maurizio] Sarri and for Chelsea that they don't rate him as highly as some of the other clubs showing interest do, but he is seen as a really hot commodity. "German clubs see the 17 to 19-year-olds who cannot get into the first team at big clubs in England, and they feel these are guys who are ready to play in any team anywhere. "How the Premier League works - the reluctance of many managers to play these youngsters and the reluctance of clubs to give one of their rivals one of these players - has led to a growth in Bundesliga interest. "It's very difficult for players to pass through the bottle-neck, so what Sancho has shown is the only effective way of doing things - either going on loan or actually take the plunge. "Game time is ultimately more important, especially in those crucial years of 17, 18, 19, 20 and 21. English culture talks of a 'Bermuda Triangle' where a lot of these youngsters just get lost. It's one of the down sides to the English system that there are no second teams. "I understand why, but for these guys it's a real down side as they've got nowhere to go. The Bundesliga offers a way out for them."